I would have guessed pencils would be made of whatever wood was handy. Leftover odds and ends too small for building a house or shelf, but enough for a pencil. Apparently not the case. But why? And especially consider swanky tropical wood from long vanished forests: new wood is spendy now, but when it is in the form of a beat up dresser from the 1960s, valueless. It could still be a pencil. The BUNGCO Pencilsmith (actually a loud machine in a shed) allows one to drop in pieces of wood, from which pencils will be generated. Rinpoche Garvin sits outside the shed and identifies each piece as to type of wood, and then into the hopper they go, and pencils are made. One can buy various sets. Wood types of your region (made from tree trimmings), tropical wood (reclaimed and salvaged), Old Bowling Pin Pencils, etc. Write. Sharpen. Twirl. Nibble, cautiously. Smell. This is how that wood is. This idea is inspired by the ad I am shown repeatedly for spinning tops, each made of a different type of metal. Nickel. Aluminum. Tungsten! But when I found that several were not actually of different types of metal but just different color platings I said "bah". Still the concept appeals to me. Can I have a 2B in softwood and a 2H in hardwood. Pick whatever you like for the HB. Today I cut what seemed to me to be a complex wood joint - diagonal in three dimensions (spatial ones) - using a japanese saw (fine blade for cross, medium blade for rip). Just the other day there was a trivia question on a TV game show about the wood used to make bowling pins: Maple, as it happens. What wood were you cutting, Ian? One of the important things about pencils is that they need sharpening. 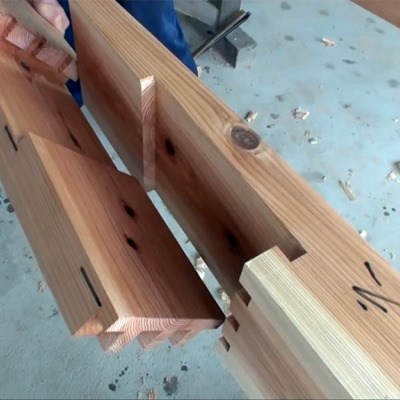 This imposes certain limitations on the types of wood that work well for pencils, various cedars being by far the best. Also, [Ian], if you were cutting a joint that was diagonal in three dimensions, would it not have been simpler just to stand a little to the left and stoop a bit, then cut everything at right-angles? And when your swanky pencil is reduced to shavings in the sharpener you can dump them into the hopper and make a new one! Science enthusiasts might really like a genetically engineered GFP or BFP white wood pencil of a light pastel shade of green or blue. I like that GMO pencil. It would also outrage some folks, allowing one to charge a premium. Do they still use primitive writing implements in schools ? I only use pencils for DIY markings. Persistence [ian]! You'll make a square cut eventually. persistence [the porpoise] You'll get your annotation right, eventually. I think he was going for some samurai style dovetail. castellations aside; drill, dowel and glue is very practical. This would not have gone down well in old South Africa.